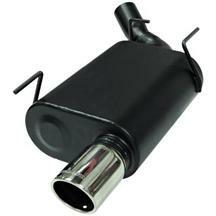 A great sounding exhaust note on your Mustang can set your V6 Mustang apart from the crowd! 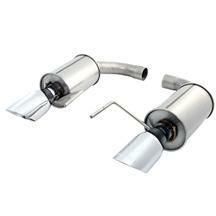 We have the best Mustang V6 Exhaust prices on the market. 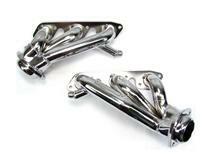 It doesn't matter if you need Mustang V6 shorty headers to replace your factory Mustang exhaust manifolds or Mustang V6 long tube headers for that great Mustang sound and performance! 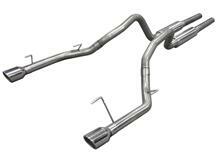 A Mustang V6 Dual exhaust conversion kit can increase power, gas mileage and looks by creating the symmetrical look the V8 Mustangs have with dual tailpipes coming from the rear bumper. 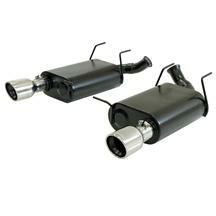 Our Mustang Mufflers, Mustang Headers, Mustang X-pipe, Mustang H-pipe, Mustang Axle backs and Mustang exhaust tips are in stock from brands like BBK Performance, Ford Racing, Pypes, Magnaflow, Flowmaster and more. 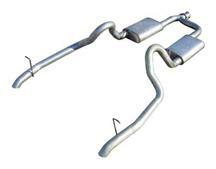 These V6 Mustang Exhaust Kits Fit: 1998, 1999, 2000, 2001, 2002, 2003, 2004, 2005, 2006, 2007, 2008, 2009, 2010, 2011, 2012, 2013, 2014, 2015, and 2016 Ford Mustangs!